I'm working on a Sunday school lesson for this Sunday, based on Ezekiel 11:14-21. Is it wrong to say that I just don't like Ezekiel? That if I had my own choice about the matter, I would be teaching something else? The truth is I do have a choice -- I could choose to teach from something else, but I decided to stick to the curriculum -- perhaps with the same unwillingness but commitment that pastors stick to the lectionary. I'm bound to learn something, right? As I type this, I'm sitting at my desk, right in the middle of lesson prep work. Here's something I never noticed before (and before you comment, yes, I know it's not the meaning of the text -- I'm just stating a parallel that came to my mind). When Ezekiel the prophet was exiled to Babylon, there was much corruption and sin in Israel. It was assumed that God was alive in the Temple, and when the people let Israel, they left God behind. How horrible to think that you were leaving the presence of God. Thus says the Lord God: Though I removed them far away among the nations, and though I scattered them among the countries, yet I have been a sanctuary to them for a little while in the countries where they have gone. The author of the teacher's manual says that the people, separated from the ways that they knew to be in touch with God -- through the temple and the sacrifices -- would now reach God through God's people. People like Ezekiel. Ezekiel speaks of transformation. He speaks of a reliance upon God instead of on oneself. Does this not remind you of the New Testament? God, realizing the sinful nature of his children, goes with them. He sent his son to live among us, not only in the same place, but as one of us (a new development from Ezekiel). We are able to reach God through each other. And we have a new covenant -- a transformative power that is dependent entirely upon grace. It is a gift, not earned by us, but given to us. My musings as I prepare to teach. I was reading the Disciplines book this week. The author talked about the idea of being "dust." Remember that you are ashes, and to ashes you will return. This comparison to ashes is a reminder to us of our humanity, but also of our state of being. When we remember that we are ashes, we also remember that God will lift us up and help us. 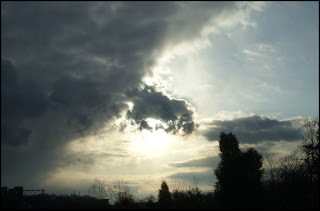 When we are open to God -- and maybe, sometimes, that openness needs to be jump started with a realization of our own limitations -- we find that we are willing to give up control to Him. When we know we can't do it on our own, perhaps we are more likely to let go and to involve God. In the sermon last Sunday, Jack showed us a film clip from the archives of the College basketball tournament. It was a series of exciting plays, set to music. I don't normally watch basketball on TV. I was thinking, as I watched it, that if basketball were always like these short film clips, I would watch it. It's those long runs of time between the exciting bits that I don't enjoy. I wonder if ministry is like that. We find joy in the mountaintop experiences. We like the exciting parts, but I think we would rather skip the mundane, hard work in between. Jack told us on Sunday that God doesn't let us stay on the mountaintop. He brings us back to normal life in the valley. Why does he do that? We seem so much closer to him on top of the mountain. I think he leads us to the foot of the mountain because that's where the ministry is. It's the everyday, routine tasks that are the often the work of God. It's those items that we don't recognize as ministry, or that we don't see the purpose of, or that we find boring and unglorified that are also the work of God. He calls us to work to get our hands dirty, to touch ordinary lives like our own. And we should join him, because this is where he dwells. Standing on the edge of a journey. On the edge of the beginning of the end. and knowing what it held. His path to the cross, the nails, and death. On the edge of service. with the poor, the downtrodden, the lost. Do we count the cost? or if the path is too dark? 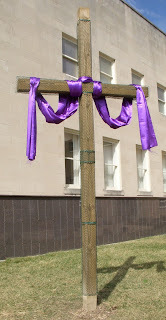 Do we take the step through the portal into Lent? Or do we stay at the edge? Standing on the edge of Lent. 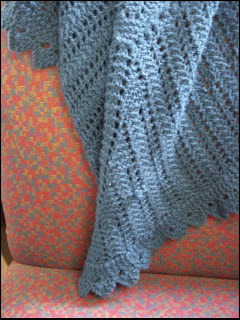 A few years ago, I knitted a shawl. When I moved into my new office, I brought it in for chilly moments. Truthfully, it matches the chair where I leave it, and I suspect that our home hall closet has a moth. The shawl is safer at work. I was looking at it today. I actually have no idea how I made it. I cast on, knitted according to the pattern I was following, and when I was finished, I had a shawl. When I look at the pattern, and read the instructions -- knit 2 together, yarn over, knit in the back loop -- I can't predict what the finished project is going to look like. The pattern tells me step by step what to do, but not why. I'm not sure what Isaiah meant when he wrote these verses, but at the time, what I thought as I read them was that God will lead us to do his will, but we won't always understand why, or what the results will be. It's OK to listen and to look, but to not understand. We may not always know why God is leading us to the place he is. When we obey, we don't always have the privilege of knowing the big picture. And yet God calls us to obedience anyway. JtM taught Sunday school today. The topic was specifically about Isaiah and his call in Chapter 6. More generally, though, we talked about the general structure of stories when God has called the people in the Bible (and us). As as was thinking about this, I wondered was it was that we always have an objection when God calls. Does everyone always object? Are there those who have said, "Yes, Lord," right away? Is there a purpose for the objection? 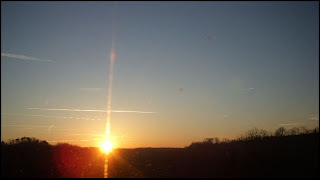 Could it be that the objection in a way for us to realize our shortcomings? Does it highlight for us our dependence upon God? Does it open our minds to the work of God in our lives so that we can be affirmed in our abilities and in his ability to supply our needs? Is it more than just our resistance? Or perhaps is it that God uses our resistance to accomplish his goals? 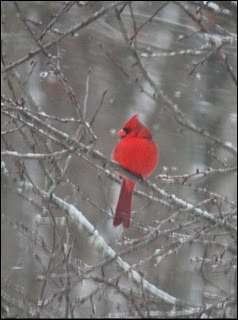 Image: Cardinal in our backyard this morning. 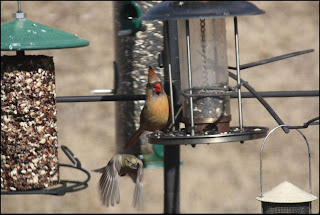 I took this with Steve's new digital SLR camera. Fun. If you can't get a good picture of a cardinal in a snow shower with that camera, then you just aren't trying hard enough. Are we open to see the unexpected? 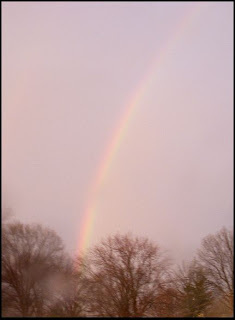 Do we remember that God may appear in our lives when we least expect it? And when we finally do open our eyes, we find the beauty of God. It's motivation to keep our eyes open! A few months ago, an acquaintance came up to me at an Emmaus gathering and asked me to pray for her. We were serving on a team together, and I had been the assistant table leader on her walk, but that was the only ways we knew each other. She told me that she was having health concerns, was worried about some upcoming tests, hadn't told anyone about them, but was telling me because she wanted me to pray for her. I was shocked that she would ask me to do that, but I told her I would. I did pray, and I sent her a couple of cards. We served on that team together, and were coincidentally (?) assigned to the same table, me as table leader and her as assistant. We got to know each other better, and I was so grateful for her service at that table. It was a gift. I hadn't heard from her after that walk in October, but I had heard that she was still having some health problems. You know how life is. You think about praying, but you forget. For a day or two you wonder about someone, but then you move on in your worries to something else. As we were driving to work last week, JtM and I were talking about the lectionary readings for the week. There was a healing theme in the scriptures. As I read them that day, I noticed the theme. As I prayed, I thought about healing, and was just quiet for a minute or two. Three names of people came to mind -- people who needed healing. Before I could change my mind, or forget to do it, I sat down and sent them cards. One of them was this woman. Tonight at the gathering, after I came out of the board meeting. I stood at the table waiting for dinner, when she came over. She said that she had only come by to see me. She couldn't stay, but wanted to tell me that she had had surgery. The day she got home from the hospital, that card was waiting for her. Amazing how God works. Amazing to me to know how his grace moved through my actions to her. Amazing Grace. I was in a meeting this week of church leaders. We were having a discussion about church growth and the possibility of using neighborhood meetings as a means to invite others into fellowship. The hope is that once a guest becomes integrated into this kind of social situation, that it would be easier to invite him or her to worship and church. There is an Emmaus saying: "Make a friend, be a friend, bring your friend to Jesus." What bothered me about the conversation was the reason for church growth. "We need invite others to church because we have something good to offer here." Is that a reason for evangelism? It worries me that until we understand WHY we are inviting others to worship and church, that we won't have much success. It isn't for church growth. It isn't because we have good programming to offer or good sermons or because we have a good time together in fellowship. I read Bishop Lyght's blog this evening. He says that evangelism "is a matter of knowing that one’s life is better off because of one’s relationship with God, and wanting others to benefit from such a relationship. Has being a Christian made any difference in your life? If so, you will want to share that reality with other people." We are called to make disciples for Jesus Christ for the transformation of the world. I think until we get that, until we understand that a relationship with God lies at the heart of evangelism (as the Bishop points out) that we won't have much success. Until we get that, we won't invite God into the process. I believe that without God, we will not succeed. I think it is way easier to know when someone has impacted your life. Maybe we should take a lesson from the Sunday School participant who sent you a note and let people know when they help us grow. I think that we all have a need for affirmation. I worry sometimes that my affirmation quota may be higher than it should be; I know that I have a need for it. I also think that the ability to affirm and encourage is a spiritual gift. God knows our needs and have supplied people with the ability to provide for that need. I have a friend who decided to write a note to a gentleman in our church, telling the gentleman how he had affected this friend's life. I watched this gentleman (the reciepient of the note) come close to tears as he told us about the letter. A few months later the recipeint died. I haven't asked my friend, but I imagine that he is very grateful that he took the time to send the letter -- that he didn't wait until it was too late. God will move us to actions such as this. We do need to take the time to tell those who have touched our lives how important and transformational their actions and words have been. We need to tell them the difference they have made in our lives. When we do that, we find that the action of affirmation is in turns a blessing to the affirmer. That's how life is Christ is. Image: Sunrise on HHS hill the other morning. I wonder why it is that prophets kept telling Elisha that his master was going to be taken into heaven. Is it to emphasize the importance of the event? I do notice that Elisha doesn't want to hear the news from them. I wonder why that is. Why does Elijah keep suggesting to Elisha that he shouldn't follow him all the way? Is he trying to save his student from seeing him leave? I don't know, but it does remind me of Ruth and her "whither thou goest" statement. The parting of the Jordon for them to cross to the other side reminds me of Moses, parting the Red Sea. Does that emphasize that Elijah is going to the promised land? Even seeing the magnificent ascension of Elijah, Elisha still is upset by the lost. So will we be. Elisha asks for a double portion of his teachers spirit. Did he fell unequipped for the job in front of him. Is it to remind us that God will equip us to do what he calls us to do? Is he saying, "let me be like you?" I wonder how this passage can remind us of Christ's ascension. Are we called to follow Christ -- whither he goes -- and are we to be a reflection of him in the world? I was listening to a knitting blog today. The speaker was talking about her "talisman scarf." This was a knitting project that she started during a vacation to Alaska, so as she looked at it, it reminded her of her vacation adventure. Just following vacation, she fell down her basement stairs, breaking her neck. The next several months were a time of healing, and as she slowly recovered her life, she received hope from knitting her on scarf -- that life would at some time return to normal. The scarf, when she wore it later, reminded her of both of these times in her life. I just finished knitting a scarf last month that I started on a youth retreat. When I look at it, I remember sitting in the living area of the cabin, early in the morning,, or later in the day, as youth walked around, knitting. Objects, I think, become linked in our minds to events. I wonder, as I think about it, if the same thing happens to churches. Is there such resistance to any kind of change to a church building because we relate some of our spiritual experiences to the physical place? Are members threatened, not by the change in the space, but by the loss of the association? In Sunday school today, we were asked if we could think of an instance where something we had done (and I don't remember the question exactly) had a positive impact on someone else's faith. Have you ever done something that helped someone else to see God or that led someone else to a transformational realization? I don't know if I've ever done that. I do know, though, that other people have done that for me. In high school, my involvement in church was high. We had a strong youth group; I very much enjoyed my time in UMYF. In fact, I remember thinking in an officers' meeting one day that it would be a great goal in life to have a job that I enjoyed as much as being in youth group. After I went to college though, I lost my desire to go to church. While our church had a strong youth group, it did (and doesn't) have a particularly strong program for college kids. I would just as soon skip church as go. Once I got married, I still felt that way. My husband didn't, though. His desire to attend church inspired my own. I can't imagine what my life would be like without my involvement in church, and it was his attitude which changed my own. Before we had the boys, I took a two year class at church -- 2 1/2 hours a week -- to learn how to teach the Bethel Bible series. During that time, the pastor who taught the class told me that a particular Sunday school class needed a substitute for a week, and that I was going to do it. I had never taught Sunday school before, and I was scared to death, but I did it. He insisted on it. After that, I would teach now and then. One week, after teaching a Sunday school class -- I think it was about worrying -- I received a note from a person in the class, affirming my teaching ability. It was the beginning of my believing not just that I COULD teach, but that I WAS a teacher -- if that makes any sense. That difference changed my attitude -- teaching was not just something I did; it became something that I could not not do. Several people -- each at different times -- invited me to go on an Emmaus walk. I did, and it was transformational. One day I got an email that said, "Apply." I did. I don't know if I have shown other people the presence of God, or if I have been part of God's transformational work in the world, but I know God has worked through other people to change my life. And I am grateful. 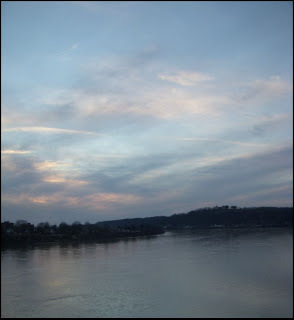 Image: The Ohio River last Thursday. 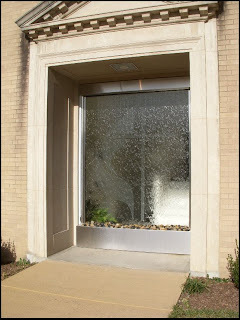 St. Marks UMC, in Charleston, where our offices are located, removed a door and installed a waterfall. Just saying that sounds odd to me, but the results are really kind of stunning. The water falls down in sheets on both sides of a glass window. 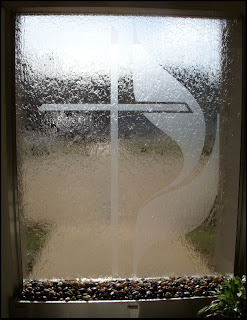 The cross and flame is etched into the glass (I think). The first picture is from the outside. It's hard to see the cross, but it's there. The waterfall is the same on the inside, although the cross and flame is backwards. I've been thinking all day that there was some kind of spiritual lesson in that. I still can't quite pinpoint it. When we were walking in from lunch the other day, we ran into someone in the parking lot with whom we have had several conversations lately. He and his wife have opened a mission project in their part of the state. He said something that I always want to remember. He said that since they started this project, he has tried to never let the money dictate the ministry (although he said it more eloquently than that). The money should not take the lead. Since he has adopted that policy, God has provided. I like what he said. We are called to listen to God and to discern what his call is upon our lives. Once we know that, we can be obedient and allow God to take the lead. THEN we can reach for the resources to make the ministry happen. That's a whole different tact than looking at the available money and allowing that number to outline the ministry to be done. Once way allows God to be in the center; the other method places money has the limiting factor. 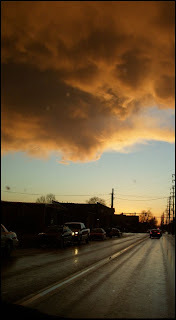 Image: More of our very strange sky last night. Imagine holding your newborn child on one of those nights when it was still a novel adventure to be caring for a baby in the middle of the night. Remember standing in the nursery, rocking your child back and forth while she slept, and singing some wordless tune to her, loving the sight of her peaceful face and the touch of her soft hair. Remember that love. Imagine holding your toddler while you read a book together with him sitting on your lap as you said, “Hop on Pop.” Remember the gentle touch of his heal as he kicked his leg back and forth to the rhythm of the words. Think of his joy in the pictures as he pointed out the silly Dr. Seuss characters, interrupting your sing-song voice as you recited the poetry. Remember that love. Imagine dancing with your wife for the first time in a few years. Remember the sway of your bodies as you listened to the music and moved to the beat, slowly translating the tune into motion. Remember the feel of the silk of her dress between your hand and her back as you thought of the first time you danced together. Think of the love the two of you have shared through life, through the routine of day to day living, as you hum the melody of the music into her hair. Remember that love. Remember love like that. Realize that the love of God is much like that, except that it is exponentially more. I read this week sometime in an email that romantic love can be compared to the love of God – loving someone in spite of their faults, without seeing their faults, or perhaps because of them. God’s love is like that. One night, in the middle of the night, I was lying awake, wondering what heaven would be like. I’ve never told this to anyone, because it sound pretentious and maybe silly, but that night, in the middle of the darkness, I think God granted me a tiny taste of heaven. I felt a love so strong that it had to be from God. Grace is like that. God’s love is like that. I think that the only way that we can describe God’s love with any accuracy is to say that it is beyond our imagination. 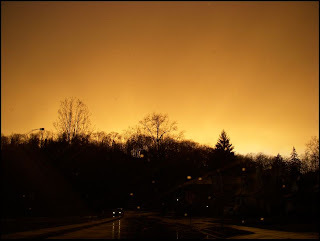 Image: The sky this evening was yellow right after a big storm front rolled through. The Disciplines devotional this morning started me thinking. The author focused on listening. Do we value listening enough? Do we listen? Do we consider that it is important? In the lectionary reading this week about Naaman (2 Kings 5:1-14), the commander comes to Elisha with preconceptions. Do we fail to hear people because of our preconceptions -- about what they are going to say, about who we think they are? Is that really listening? Do we listen to people while planning what we are going to say next? Are we so focused on our own agendas and our own thoughts that we can't hear what is being said to us? Is that really listening? Do we try to listen to someone while at the same time focusing on something else? Are we really that good at multitasking, or do we just think we are? Is that really listening? What is listening? Could it be that listening is an expression of love? Do we realize that listening to someone validates who they are? Listening to someone, focusing on that person to the exclusion of our own agendas and thoughts, says that the other person, "You are important, and you are interesting enough and important enough to me for me to set aside what I am doing to listen to you." Listening with our hearts is an expression of love. Why do I not remember? Isaiah 40:21: Have you not known? Have you not heard? Has it not been told you from the beginning? Have you not understood from the foundations of the earth? In the sermon yesterday, Jack said that we will come to know and understand God through personal experience of him. We will come to understand God through what he has done in our lives and through our remembering of him. Each year, when I plan the Lenten devotional ministry for our church, I worry that it is not going to work. Each year, I hesitate to take the step to commit to doing it for fear that we will not have enough authors. It is only when I take that step, however, that the ministry takes off. Once I do that, then there are always enough people who will write. Why is this a lesson that I need to learn EACH year? Why don't I remember that this mustard seed step of faith -- this trusting in God -- is a necessary first step? Think about this passage for a minute. God knows and we know that we will face challenges in life. Jack, today in his sermon, talked about how when everything is going well in our lives, we tend to forget the presence of God in our lives. When everything seems to be going poorly, we tend to think that God is no where to be found. But read this passage. I was struck today in worship with the idea of what a wonderful God we have. He knows that we will face exile, challenges to our lives, suffering and pain. What is his response? If we will remember God, he will come into our lives and give us strength and power so that we can survive whatever life throws at us. What kind of wonderful love is this? The God of the universe, who knows us better than we know ourselves, is willing to strengthen us to face whatever comes our way. What kind of love is this? Our God continues to remind us of who we are and whose we are and who he is. He doesn't leave us alone, even when we forget about him, and even when we assume that he is not in our lives. This incredible love means that he never leaves us along, never deserts us. The irony of commitment is that it is deeply liberating -- in work, in play, in love. The act frees you from the tyranny of your internal critic, from the fear that likes to dress iteself up and parade around as rational hesitatition. To committ is to remove your head as the barrier to your life. -- Anne Morriss (Starkbucks customer from New York City who describes herself as an "organization bilder, restless american citizen, optimist." We rarely see commitment as a liberating act, but I think she's right. What is the effect of commitment? How is it freeing in your life? 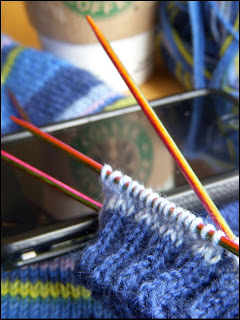 Image: My knitting at Starbucks this afternoon, along with Steve's iPhone and Starbucks cup. In order to spread the gospel, Paul is willing to be a slave to all. He will be a Jew for the Jews, a person outside the law for those outside the law, and weak for those who are weak. We talk in the church about "meeting people where they are." I think this is more than that. Paul is talking not just about meeting people where they are, but becoming one of them. Not just walking among them, but walking as one of them. We have a worship service at our church called Common Grounds. The congregation is composed mainly of homeless or marginally homeless people. Reaching this population with the gospel means more than just inviting them in, it means sitting down with them and talking with them. Being a part of what is happening. Jesus teaches us everything. He is the perfect example of not just walking among us, but becoming one of us. If you could, what room in the place you are currently living would you redo first? In practically, the upstairs bathroom really needs a redo. If I didn't need to do that, I would redo the kitchen. The stairs need refinished, and Steve and I could do that on our own, but we just haven't found the time. What feature do you most covet? Do you have it? If not, is it within reach? Walk in closet. Full size oven instead of a small eye-level oven. Your kitchen - love it or hate it? Why? I don't hate it, although there are things about it that I would love to change. I like that it is an eat-in kitchen and that there is truly room in the kitchen for two cooks. I would love to replace the oven and stove and would love to redo the cabinets. Also, someone decided before we moved in that the countertop needed a built-in cutting board. That person was wrong. Here is $10,000 and you HAVE to spend it on the place you are living now. What do you do? Bathroom. Kitchen. Add a walk in closet to the bed room. BONUS: Why do you think there was such a surplus of ugly bathroom tile colors showcased in all homes built from the 1950's right through the early 80's? I don't know, but I have some of those ugly tiles. In his book The Life You've Always Wanted, John Ortberg says, "Confession is not primarily something God has us to do because he needs it...We need to confess in order to heal and change." He talks about how we often think of confession as being legalistic -- make a confession and have a sin erased -- transactional. Instead, confessional should be transformational. It reminds me of a description of prayer from the class JtM and I taught on Yancey's Prayer book. Prayer should develop a relationship with God, and yet so often we use it because we see it as a transaction with God. Confession. Is there anything that makes us more vulnerable than confession? To admit before God that we are wrong is to become vulnerable before God (and ourselves). Confession empties us -- our hearts and hands and spirits -- so that we can be open before God and accept the freedom of forgiveness and grace. Ortberg also says that confession is not just the idea of grace, but is the reality of grace. God doesn't ask us to do it our of his own self-interest, or out of a need to hear our admissions. Better than we know, he knows how it can be grace. "As a pastor, I'm not a theology policeman...But if we are part of a community where the Scriptures are honored, I don't think we have to worry too much. The Spirit works through community. Somebody will have a stupid, screwy idea. That's okay. The point of having creeds and confessions and traditions is to keep us in touch with the obvious errors." The above quote is by Eugene Peterson, from Having Ears, Do you Not Hear? You can include this on the list of reasons that I am blessed to be a United Methodist -- we learn from each other in community. (Maybe members of other denominations would say the same thing, but I only know about my own). Got a different idea? Share it among your community. We learn from each other through the stretch and pull of conversation. Disagree? Discuss it with each other with love and grace. From that environment, we learn from each other. We have creeds and beliefs as touchstones of faith, to keep us on the path. God will live among us and guide our thoughts through each other. It's a wonderful gift, to share questions of faith with friends. From this can grow understanding. 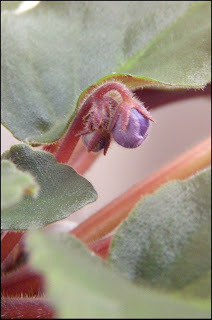 Image: African Violet in office is about to bloom. The devotional at our office meeting today was based on parts of Psalm 91. That particular phrase stopped me. I was thinking as she read -- there are so many traps that I fall into. Traps that grab me when I say things that I should not -- when I do things that I later think are mistakes. How often do I need someone to stand in front of me and say, "Don't you remember? You say you have faith, and yet there are times when you do not seem to act as if you are aware that God is God." If I remembered, and if I listened, then perhaps he could do as he promises, and save me from the traps that catch me when I do not remember him. One of the lectionary readings for the week is Mark 1:21-28. Jack preached today about healing -- how we all have ways in which we can be healed and ways in which we can heal each other. I thought it was a good word to bring to the congregation. What are our "demons?" We think of them as BIG -- as evil incarnate -- but instead think of those things that cloud our thoughts and separate us from a feeling of peace. What kinds of things disturb our minds and dance through our thoughts? They can be giant things -- there is a gentleman in our Sunday school class who is battling drug and alcohol addiction. He's working through this, but isn't this something that our church can help with, too? Can we be a healing element in this battle? Another member of our Sunday school class lost her sister last week? I know that there are ways in which our church can help with that kind of sadness. We can't fix it, but we can be grace. MT was the liturgist today, and she led the Children's moment. She talked about ways that we use our hands -- good ways of helping and bad ways of hurting. Can't a touch be healing? A handshake? A hug? A touch? Aren't there things that we carry around with us that need healing? Mistakes that we have made? Things that worry our minds? That we wish we could change? I was mean to a friend last week, and it has stuck in my mind. Our lives are fertile grounds for the healing of grace. Jack was right.